These seven slave narratives, recorded between 1798 and 1929, record the experiences of both plantation and urban slavery. Each narrative paints a fuller picture of enslavement as experienced specifically in South Carolina. Charleston was the primary port of entry for enslaved Africans, so the experience of enslavement in South Carolina has important historical significance when trying to understand the larger impact of slavery on the United States. Susanna Ashton and Robyn E. Adams. I Belong to South Carolina: South Carolina Slave Narratives. 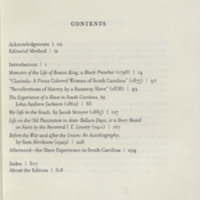 Columbia: University of South Carolina Press, 2010. A version of this text is available online for Lehigh users.